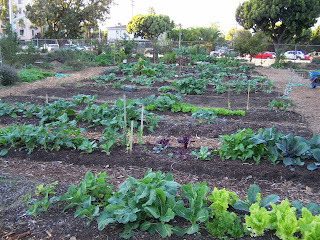 Venice High School students grow a variety of winter vegetables in their gardens at The Learning Garden, including broccoli, cabbages, chard, kale, lettuce and peas. In 2002, volunteers from the community gathered to create a garden at Venice High School on the unused portion of a garden site that was being used as a dumping ground by the high school. There were a few gardening classes, but their efforts only used a small portion of the almost one acre site, with the rest of it untouched. The community volunteers, led by David Crow and Julie Mann, both educated in the traditions of using plants (herbs) as medicine, formed a not for profit, 501 (c) 3, called The Learning Garden. From that day forward, the portion of the garden not used by the high school students has been transformed into a vibrant and lush little Eden in that part of Los Angeles called Mar Vista. In the six years The Learning Garden has been around, we have brought a considerable amount of resources to bear on this corner at Walgrove Avenue and Venice Boulevard. The Garden boasts one of the most eclectic collections of Chinese Medicinal plants in any public garden, as well as plants from the Ayurvedic and homeopathic herbal traditions. We have planted over 50 fruit trees and have a beautiful succulent garden and a California Native garden, both curated and cared for by one very dedicated volunteer. The garden sends all excess produce to the West Los Angeles Food Bank – in many weeks we take over 20 to 40 pounds of food – we always include fresh herbs as well as the vegetables and occasional fruit because all food, even food for people in need, should taste good. Most of the food we send over is excess grown by high school students or by the volunteers – our goal is for nothing to be wasted. We have worked hard to create not just a garden, but also a community. Almost every month the Garden has an event, ranging from our big gala whoop-de-do, Pesto Day, to other, more low-key events like Valentines’ Day where we make the valentines from plants and objects found in the Garden. Now in it’s sixth year, the Garden is no longer funded. We hold plant sales which pay for potting soil and other incidentals but there is no more money for staff. The one single reason this Garden has been a success when so many others like this have failed is that we have had an on-site garden manager (the Gardenmaster) who has coordinated the efforts of all the volunteers and has been there to water the plants when volunteers didn’t come through. At this time, the Gardenmaster is an unpaid volunteer who shows up as much as he can while finding work to pay bills like rent, food and little things like that. In moments like these, I remember the old Vietnam War era slogan, “What if the Air Force had to have a bake sale to buy a bomber?” recalling our government’s fascination with funding wars and war making and not funding benefits for the citizens and their children. Truly, one day in Iraq could do an awful lot of good here in our own country towards ameliorating poverty and feeding everyone good, clean, healthy food. Some of us are blessed to do the work they were called to do. Having been the Gardenmaster in charge of this project, for the last six years, I have been one of those so blessed. 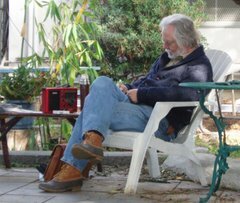 The time I have spent with The Learning Garden has been an economic challenge, but I would not trade one day at the Garden for a paycheck from behind the desk. The lives that have been touched by this project cannot be calculated – from pre-schoolers, to elementary students, to high school students from several different schools, and the adults that volunteer and the students of UCLA Extension and other adult schools. Every school needs a learning garden. But it is not a priority among the brass at the LA Unified School District – and probably at very few schools. Still, we, as a society, cannot forget where our food comes from and ought not forget how it’s grown. Remaining somewhat connected to the earth aids our society in ways large and small, though we might not see it for a decade or more. Our detachment from nature in a world of cement and shopping malls and gang violence can be ameliorated with the presence of a garden in a school that gives respite to the students and teachers and provides an object lesson in the ever changing canvass of life. Funding opportunities exist! Will you help us keep the gates to The Learning Garden open? Contact me and I’ll put you in touch with our treasurer; all donations are tax-deductible – might be better karma to help fund The Learning Garden instead of another bomber.